Home » Blog » Consuming Raw Asparagus: Is it Safe? Perhaps you’re trying to cut calories and you’ve decided to eat raw asparagus instead of sauteing or steaming it. Or, maybe your latest salad recipe calls for chopped raw asparagus. Is it safe to pack raw asparagus in your child’s lunchbox or as a healthy post-practice snack? 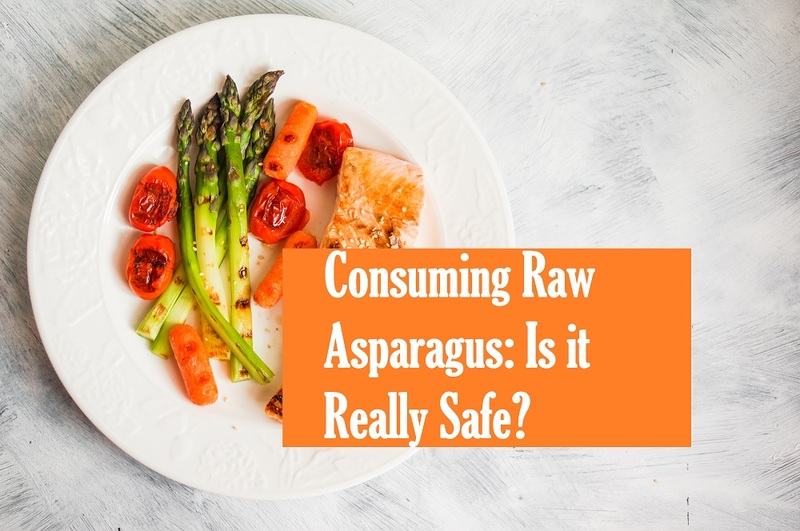 It’s important to know the relevant health facts before consuming raw vegetables, especially raw asparagus. Eating asparagus raw will fulfill 7% of your daily fiber needs. The fibrous vegetable is also diet-friendly- it’s low on carbs and calories, and high-fiber foods make you feel full faster. United States Department of Agriculture (USDA) statistics show that one cup of raw asparagus contains only 27 calories. Raw asparagus can help to build strong bones and maintain your blood’s normal clotting properties; it’s rich in Vitamin K.
Another benefit of raw asparagus is that it aids your body in the breaking down of free radicals and carcinogenic compounds. Asparagine, an amino acid named for the vegetable, is a naturally-occurring diuretic that cleanses the digestive system of extra salts and toxic bacteria. As raw asparagus is also a source of B12, elderly individuals should consider eating it periodically to increase their B12 levels as their ability to absorb the vitamin decreases with age. There’s also evidence that asparagus improves cognitive functioning and wards off dementia symptoms associated with Alzheimers’ disease. It contains folate as well, and the Australian Department of Health studies have shown that pregnant women who maintain high folate levels are less likely to have babies with neurological defects such as spina bifida. Both raw asparagus and cooked asparagus are beneficial for your health. In fact, cooking asparagus, like cooking any vegetable, can neutralize harmful bacteria and increase the number of anti-carcinogenic antioxidants. 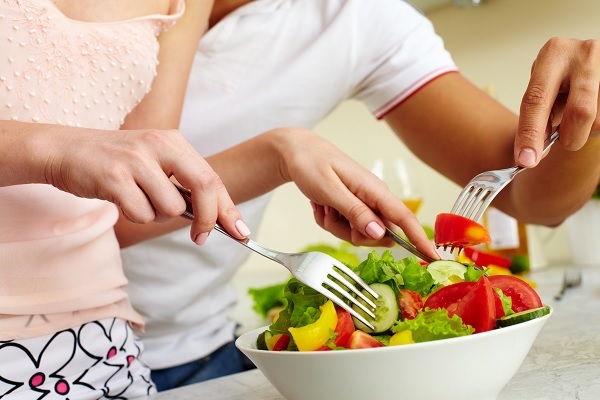 Of course, the method of cooking affects the healthiness of the food. It’s inadvisable to deep-fry asparagus, as frying vegetables in large amounts of oil lead to high calorie and carbohydrate counts, ultimately resulting in clogged arteries. Instead, the healthiest cooking methods are steaming, sauteing, broiling and grilling. Grilled asparagus with a drizzle of lemon can be a scrumptious and healthy appetizer on hot summer days. Or try eggs Benedict with a side of steamed asparagus for a delicious, vitamin-filled breakfast. Cooking asparagus reduces the advantages of its fiber; however, the breakdown of fibrous cells makes it easier for the body to absorb Vitamin B12, Vitamin K, and folate (Vitamin B9). Raw asparagus is still a great snack for children, yet elderly people with trouble chewing may find cooked asparagus easier to consume. The International Journal of Molecular Sciences published an important study concluding that boiling increased the total phenolic content of green asparagus. To reach a happy medium, consider blanching the asparagus. Blanching is a cooking technique in which you boil a vegetable, then submerge it in ice water to maintain its outer crispness. Can you ever eat too much healthy food? The American Kennel Club says that dogs can. Raw asparagus can be very difficult for dogs to safely consume and digest, even if it’s chopped into smaller pieces. If you want to feed asparagus to your dog, it’s better that you cook it, as raw can lead to diarrhea, gas or vomiting. Humans can also get gas sometimes when they eat asparagus raw; not to mention that asparagus is famous for its distinctive odor when it’s expelled in the urine. There aren’t very many risks unless you have an asparagus allergy. Asparagus allergies can’t be confirmed unless your doctor performs an allergy test. That said, if you experience trouble breathing, hives, a running nose or swelling after consuming asparagus, you should avoid eating that vegetable in the future. Asparagus comes in three color varieties: purple, white and green. Each variety has its own unique characteristics as well as some traits in common with its siblings. Purple asparagus is the softest and the tenderest, so it’s the easiest asparagus variety to eat raw. If you want to maintain the brilliant color of purple asparagus, then subject it to minimum cooking time, as long cooking times force it to turn dull and green. There is a correlation between the color of purple asparagus and its health benefits. The spears contain significantly elevated levels of anthocyanins. Food & Nutrition Research published an article two years ago explaining that anthocyanins are antioxidants that can help reduce the likelihood of developing chronic disease. Does this mean that white asparagus has no nutritional value? White asparagus lacks the traditional green color because it’s grown underground where it can’t produce chlorophyll and undergo photosynthesis from the sun’s rays. White asparagus is originally more bitter than the other varieties and is traditionally used in German cooking. Don’t blanch white asparagus; the best cooking method is to steam or boil it completely, finishing with a soft texture as delicate as its taste. That’s because raw white asparagus is extremely tough and much thicker than green asparagus, so consuming it before cooking would be somewhat unpleasant. Finally, we get to the stereotypical green asparagus. Green asparagus is the most flexible of all the varieties. It’s stable enough to be steamed or boiled without losing its color, yet with enough of a pleasing taste to be edible when raw. Green asparagus also contains the highest amounts of vitamins, minerals and fiber. In short, it’s the healthiest asparagus variant. Since it’s green, it also boasts higher levels of beta carotene than purple or white asparagus. You can buy asparagus year round, but its prime harvest season is at the end of spring. Preserving the freshness of your raw asparagus starts from the moment you pick your asparagus at your local greengrocer, farmer’s market or supermarket. When choosing your asparagus look at the spears and the stems. Don’t choose limp asparagus and make sure the spears are either green or violet. That way you can be sure to select ripe asparagus that hasn’t spoiled. If you’re not going to cook the asparagus straight away, refrigerate it while keeping the base of the stem damp. You can do this by wrapping the stems in damp paper towels. Asparagus becomes starchy quite quickly, so don’t store it in the refrigerator for longer than three to four days. You’ll know that the asparagus has started to spoil when the tips change in color from violet to black, and they become soft and squishy to the touch. Eventually, the stem will become mushy as well, and you’ll have to throw it out. In conclusion, eating raw asparagus is a fantastically healthy way to get the vitamins and minerals that you need. Here are just a few quick takeaways so you can get started picking out your asparagus and cooking it or eating raw. Pick firm asparagus with healthy tips. Choose from white, purple or green asparagus. Avoid feeding raw asparagus to your dog. Cook it first. It is rich in fiber, Vitamin K, folate, Vitamin A, Vitamin B12 and Vitamin C.